“Health is not just being disease-free. Yoga, as a tool, is a profound study of the human system. It offers a host of practices and deep insights into various aspects of the human body and mind. Isha Research Center aspires to bring a deeper understanding and awareness to the yogic sciences, practices and their health effects on the human system through rigorous scientific studies. Isha Foundation has been offering classical form of yogic practices for over 30 years. A great number of practitioners have been reported a wide variety of health benefits such as improvement or elimination of physical and psychological chronic ailments, elevated mood and energy, enhanced social competency and a general heightened sense of aliveness and wellbeing. The mechanisms behind these positive effects, observed variabilities between practitioners and the functional differences between various practices have been explored to some extent. Further extensive scientific research is required to unearth the health effects of Isha Yogic practices not only as a tool for symptom management/improvement but also a potential holistic system to promote healing and optimal wellbeing. Isha Research Center is an initiative by dedicated volunteers who are medical doctors, nurses and scientists by training. Isha Research Center endeavors to bring together the unique strengths of ancient yogic knowledge with rapidly evolving modern science to achieve a more integrated understanding of this marvelous mechanism – the human system. Incorporating the most advanced scientific findings along with state-of-the-art technology and in collaboration with researchers from various fields, Isha Research Center strives to explore the potential of yogic practices in promoting physical, mental and emotional wellbeing. The following ongoing studies are attempting to provide objective evidence for Isha practices. These studies are very expensive and are currently done exclusively by IRC volunteers with minimal funding. If you feel it’s important to share objective data to validate Isha practices to the world, we ask that you offer a monetary donation. Your donation will help accelerate BSP and Samyama research efforts and bring robust evidence for scientific community and/or anyone else who would be interested in objective data. The Samyama program is one of the most intense guided meditation programs offered to the general public. There are many examples of people reporting enhanced perception and an ecstatic experience during the program. The Isha Research Center (IRC) collaborated with research faculty members from several academic institutions including Indiana University, Harvard University, University of Tennessee, Rutgers University, and University of Florida for a study to assess how Samyama affects the psychology physiology of its participants, and household controls. This is a large prospective longitudinal study with 4 time points (pre-preparation, pre-Samyama, post Samyama and 3 months post). Physiological and psychological online surveys at above 4 time points. The online surveys include validated scales for depression, anxiety, well-being and happiness in addition to longitudinal health measures. Bhava Spandana Program (BSP) participants often report a state of blissfulness, ecstasy, inclusive perception or altered state of consciousness during and after the program. The purpose of this study is to investigate the effects of this advanced meditation program on participants’ self-reported psychological wellbeing as well as blood levels of selected neurotransmitters associated with the experience of blissfulness and joy. Data was collected from program participants in October 2017. This is the first research study conducted on BSP participants. Stress and anxiety are the leading cause of adult disability worldwide and underlying factors in many disorders such as depression, cardiovascular disease, obesity, chronic pain, gastrointestinal and sleep disorders. 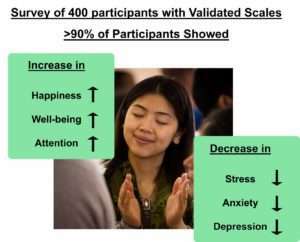 This study was conducted on 142 participants of a 3-day non-residential Inner Engineering retreat to investigate the effect of Shambhavi Mahamudra Kriya practice on perceived stress levels and general well being. The retreat included discourses on various yogic topics, yoga postures (Hatha Yoga), Isha Kriya guided meditation and Shambhavi Mahamudra Kriya (a 21-minute yogic practice incorporating the breath). Participants were instructed to practice Shambhavi Kriya twice a day for at least 6 weeks. An online survey designed to measure perceived stress levels and general well being was completed by study participants once before the retreat and once again 6 weeks after the retreat. Analysis of the results show a significant decrease in perceived stress levels and a significant increase in general well being scores within 6 weeks of regular practice. These findings suggest that a regular practice may represent an effective, natural and low-cost method for stress reduction and improving general wellbeing. A panel of scientists from various research institutes in California and Indianapolis monitored and studied physiological and psychological responses of those individuals who participated in a 3-month long residential yoga and meditation retreat held at Isha Institute of Inner Sciences, McMinnville, TN. The retreat involved daily meditation and yoga practices, accompanied by a vegetarian diet and along with daily activities. Daily regimen included approximately 2 hours of sitting meditation practices, 1–2 hours of yoga practice with a meditative component and 1 hour of chanting. Participants were assessed before and after the retreat for psychometric measures, brain derived neurotrophic factor (BDNF), circadian salivary cortisol levels, and pro- and anti-inflammatory factors. BDNF is a neurotransmitter found in brain and the rest of the body which helps with the survival of existing neurons and growth of new neurons. It is also involved in the regulation of other neurotransmitters, long term memory, stable memory function and cognitive function. 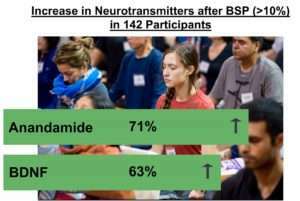 BDNF levels were found to be higher at the end of the retreat indicating improved brain health. Cortisol Awakening Response (CAR) is the increase in cortisol levels in the body within 20-30 min after waking up in the morning. Retreat participants showed higher CAR levels after the retreat as compared to the baseline measurement. This indicates enhanced physiological arousal response and alertness. Anti-inflammatory marker Interleukin-10 (IL-10) and pro-inflammatory marker Interleukin-12 (IL-12) support regulation of immunoregulation and inflammation of human body. Therefore their concentration in blood plasma is a good indicator of the inflammatory state of the body. Retreat participants showed an increase in IL-10 and decrease in IL-12 levels suggesting reduced inflammation and enhanced immunological readiness and resilience. Data also showed decreased self-reported anxiety and depression and increased mindfulness in participants. 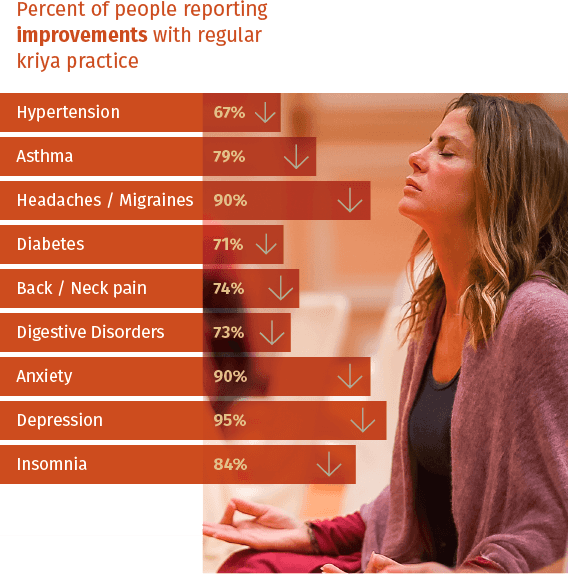 Results from this study indicate the positive effect of Isha Yoga practices on multiple important biomarkers as well as perceived anxiety levels and general mind-body wellbeing. Behavioral studies suggest a positive effect of meditation on attentional tasks. 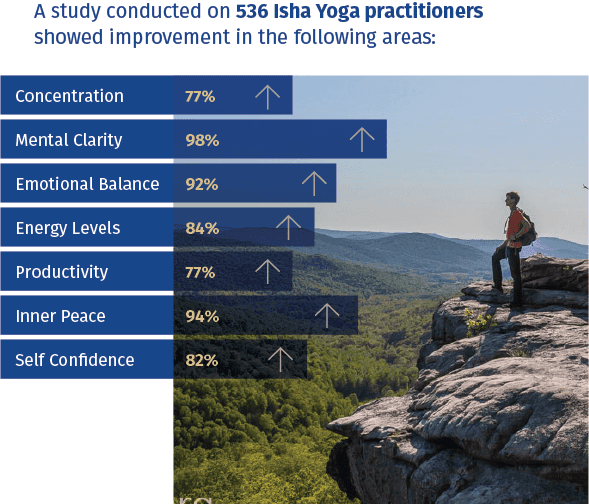 To investigate the effect of Isha Yoga on the brain’s ability to process visual information, 82 practitioners were tested at the beginning and end of the 3-months residential retreat. The retreat involved daily meditation and yoga practices, accompanied by a vegetarian diet and along with daily activities. Daily regimen included approximately 2 hours of sitting meditation practices, 1–2 hours of yoga practice with a meditative component and 1 hour of chanting. Researchers used three visual tests to monitor temporal attention, executive attention and spatial attention. They found a significant increase in cognitive flexibility and a decrease in autonomic response indicating an increase in executive attention. These results suggest that Isha Yoga can be used to further study neuroplasticity of visual attention in relation to yogic practices and can be used as an effective method for training visual attention in future studies. Autonomic nervous system plays a vital role in maintaining and regulating the functions of heart such as blood pressure and heart rate. Compromise in this system has been associated with cardiac death. In a study conducted to assess the effects of Isha yoga on cardiac autonomic nervous system, Isha yoga practitioners who had been practicing for over 6 months were compared to age and gender matched non-yoga practitioners. The practices were Surya Namaskar, 16 types of Asanas, Sakti Chalana Kriya, Shambhavi Mahamudra, and Shoonya meditation for a minimum of 2½ h every day. Heart rate, blood pressure, and Electrocardiogram (EKG) was recorded in both groups. Heart rate variability is the variation in heart rate and intervals between heart beats, and reflects how effectively, the heart’s control system responds to multitude of changes in the body. It was found that practitioners of Isha Yoga were found to have a lower blood pressure, lower resting heart rate, which is beneficial for heart and other organs and organ systems in the body. The breath rate was decreased as well, with other changes in breathing which was suggestive of better elimination of carbon dioxide, and improved blood flow to organs. Overall, this study showed that Isha yoga practitioners has a well-balanced activity of autonomic nervous system which controls the heart and breathing which in turn is beneficial to organs and physiology of the body. Are you interested in designing and conducting a research study on Isha practices? Please tell us about your research background and provide a brief proposal of the study you have in mind. Please email this information to Research@ishausa.org. We invite you to offer your expertise and contribute to our current or upcoming projects. Please summarize your skills, expertise and the time or resources you are able to offer and send to Research@ishausa.org. The Isha Research Center is committed to rigorous, high quality research. Although the members of the IRC team offer their time and resources as volunteers, significant financial resources are needed to conduct this research utilizing state-of-the-art techniques. We invite you to join us on this adventure of exploring the yogic tools for wellbeing by offering your generous support. Your donation, big or small, will make a difference.